In a sentence or so: Callilope goes bananas and decides to let Cronus out of his holding cell. Humanity's existence is threatened and it's up to the gods - and newly appointed Queen of the Underworld Kate - to stop them. We left off in The Goddess Test with Kate successfully completing the tests and going on a Greek getaway with James before heading down under to reign with Henry for 6 months out of the year. She returns to the underworld and to her husband Henry (Hades) and expects to get swept away in his arms and showered with his kisses. She's wrong. Instead, Henry is distant and preoccupied with the world coming to an end and doesn't seem to be giving Kate any attention at all. What's the deal? Aside from her marriage woes, there are some serious issues going down under the surface. Callilope is crazy as ever and decides if she can't be happy - NO ONE will be happy - and decides to really shake things up by releasing Cronus from his captivity. Cronus is a titan and one of the few that can harm the gods and destroy humanity with the flick of his wrist. To say everyone is scared to death is kind of an understatement. Kate decides to risk it all to save the world and hopes beyond hope that things will work out with her and Henry in the end. She'll have to form alliances with some undesirable characters in order to make it happen...but will it be enough? Dudes - I LOVE GREEK MYTHOLOGY. A whole helluva lot. If you haven't read my review of The Goddess Test in seven deadly sin form, I highly suggest you give it a peek before reading onward with this review. It will make some things a bit more clear. My undying love for Greek Mythology is just about the only thing that kept me reading Goddess Interrupted. I had high hopes because the plot was stellar and titans vs. olympians is just the best. Unfortunately, a bulk of the book was dedicated to Kate whining and sobbing and otherwise being lame with her relationship with Henry. I am not exaggerating when I say at least - AT LEAST - half of the plot in Goddess Interrupted is centered around her woe that Henry loves Persephone more. For real. On the plus side, the whole Cronus getting loose thing was awesome and I loved reading about the brothers and sisters and the alliances and the planning etc. Be warned that the book ends with a massive cliffhanger and a crazy twist to keep readers intrigued for book three. 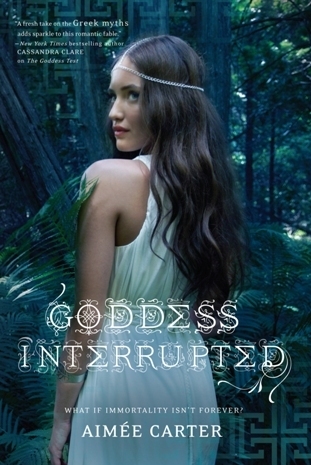 I wanted to love Goddess Interrupted. I really did. It would have been possible if not for the ridiculousness of Kate and her whining and her hiccuping sobs. She hiccup sobs more than anyone has the right to, ever. She also shows crazy bouts of courage, so I'm not sure how those two balance out...but there you have it. If you're a Greek Mythology junkie or if you've read The Goddess Test, I'd certainly recommend this your way. If you're looking for a heroine you can get behind and support and cheer on...I'm not sure you'll find it with Kate. At least, not in this installment. Fix er up: Super disappointed that so much of the plot centered around Kate feeling inadequate. It spoiled her as a character for me. So yeah... I loved Goddess Interrupted but now that you mentioned it, Kate did start to get on my nerves when I read it. She was overly whiney... I think I was too focused on the hotness that is Henry and you know... Cronus trying to take over the world to actually pay attention to her. Also, your first line of this review about Calliope going bananas made my day. Love it! "Unfortunately, a bulk of the book was dedicated to Kate whining and sobbing and otherwise being lame with her relationship with Henry." *sigh* I was absolutely afraid you would say that. I had a big problem with the plot in book one, but Kate's whining and depressed outlook didn't deter me as much as my disappointment for the seven deadly sins bit, however, I'm mortified on behalf of Kate. What the what is wrong with her?